The four Haunn cottages are set in a remote and peaceful spot on the edge of the Coronation Meadow, 15 minutes walk from the shore. There are three comfortable, beautifully simple ‘blackhouse’ cottages sleeping 2 to 4 and a stylish bungalow sleeping 2 to 4+1. Haunn is accessibly remote, and makes a perfect base for families, walkers and wildlife-watchers - with wonderful views and plenty to explore on RSPB Nature of Farming Award winning family farm. Pets welcome. Open all year. 3 & 4 Star Self Catering. GTBS. Gold Award. A warm welcome awaits you at Treshnish. 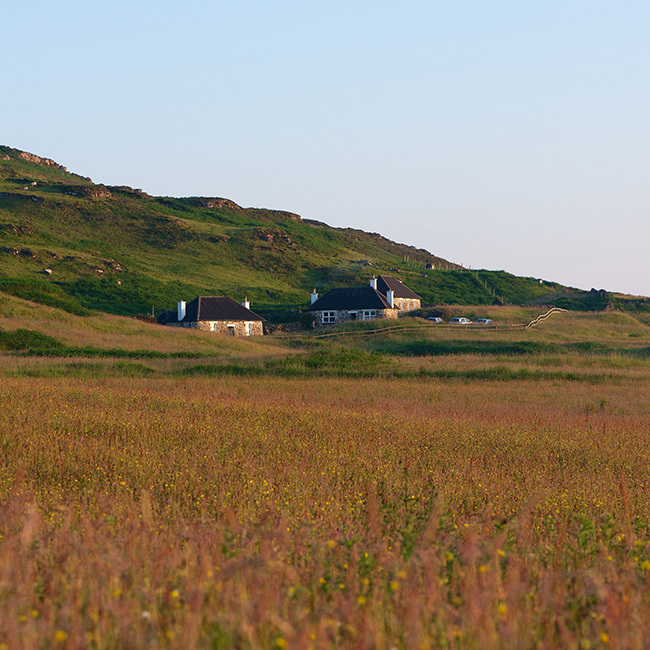 Choose one of four eco-friendly, stylish and comfortable Treshnish Cottages, located on a beautiful RSPB Award winning farm close to the stunning white sands at Calgary. Cottages sleep 2, 3, 4 and 4+2. Peaceful and quiet, with lovely sea views and walks in every direction. Dogs welcome. Open all year. STB: 3 & 4 Star Self Catering. GTBS: Gold Award. The Haunn cottages have all been carefully renovated and beautifully restored in keeping with their history and their exceptional location. Sleeping 2 to 4 persons, the 3 ‘blackhouses’ are small, simple yet charming, cottages whilst the bungalow is more spacious and contemporary sleeping up to 5. Even the recent addition of electricity brings little apparent change to their peaceful atmosphere. In keeping with their original character, these remote cottages do not have T.V.s, washing machines or microwaves. An accessibly remote location - peaceful and quiet with beautiful island/sea views and walks in every direction. GTBS: Gold Star & Carbon Footprint 2011 Awards.